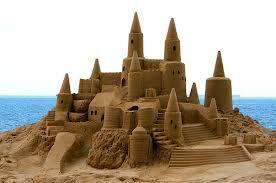 Now that's a sand castle! Just a reminder that we will not have a meeting at the Winding Wheel this Sunday (11th August) because we are off for a fabulous church day out in Scarborough. Church on the beach! It's not too late, we do still have some spaces on the coach so contact me today if you would like to come.